I’m certain that the people sitting opposite me in the Tube during my commute were absolutely amused, watching my face while I was reading. Shock, anxiety. Heart racing, eyes staring in surprise and disbelief…Because this book by Josh Malerman gave me all the feels. And yes, I’m sounding like a cliché Twitter meme but you will forgive me because Unbury Carol was quite a reading experience. I loved Bird Box but this novel…Jesus, I adored it! Definitely one of the best books of the year. Atmospheric, haunting, lively, full of wonderful characters. Carol is suffering from a shocking affliction. She falls into days-long comas that resemble little deaths. And yet, she is completely aware of her surroundings during her ‘’sleep’’. Her husband knows of her condition. But there is also another man who knows the truth. An outlaw, a fascinating man who loved Carol, who was loved by her and yet, she left her alone, under the burden of her condition. When Carol faces the ultimate danger, Moxie will have to face a series of threats in order to save her. Malerman places his outstanding story in a dark version of the Wild West and my God, what a scenery he has created! Vivid descriptions of the treacherous Trail, brilliant dialogue, scenes and sequences that send hearts racing. He mixes Magical Realism and Historical Fiction to create a fable of the Sleeping Beauty that is haunting and powerful, full of secrets and questions. Those of us who read Bird Box praised Malerman’s ability to create tension and dread through the presence of the unknown. 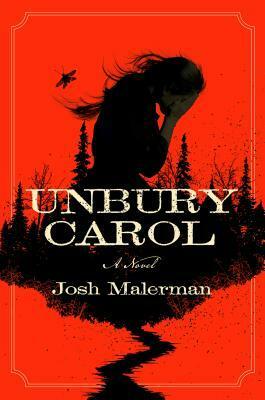 Well, Unbury Carol is a deeply humane story that deals with our greatest fear: Death. I have a confession to make. I never trusted people who said ‘’I’m not afraid of death’’. I don’t know, I am probably wrong but it just doesn’t seem right to me. It sounds like a phrase of pretentious bravery, of surrender and despair and I accept none of them. Even the notion of sacrificing your life for a ‘’greater good’’ seems strange to me but this is my cold heart talking. In any case and back to our novel, Death becomes a tangible, dreary, mystic presence. He gambles, trying to win more and more souls to condemn them to rot and be forgotten. But who gives Death the means to do so? If you thought of the word ‘’humans’’, you’d guess correctly. It is the dangerous combination of secrets, fear, and guilt that provides Death with the weapon of despair and retreat. And vanity. Carol falls victim of a vain, cruel man and it is up to her mind and soul to find a way out. Literally. The writing is gloriously good. The atmosphere of the era, the depiction of the Wild West, the interactions of the characters are worthy of an immensely talented writer that knows how to engage the readers without resorting to cheap tricks and mass-market cliches. Malerman creates a Western fairytale of the finest quality, using a dark fable and an array of extraordinary characters. This is a rather sinister fellowship. Carol, a brave young woman who gave in to despair by choosing a completely inadequate man. Moxie, an outlaw, a man of secrets and follies, a man who seems to have sprung out of the finest old Western films, a man you cannot help but fall in love with. Opal, a brave protector of the law. Farrah, a faithful, clever companion to Carol. Hattie, Carol’s mother, who taught her to be a survivor. Evans, the devil incarnate. Smoke, a terrifying, hypnotizing, cult figure. And Rot. A presence that will haunt your sleep. It cannot get any better than that. It really can’t. This novel aimed at my heart (ridiculously bad pun intended) and won it from the very first pages. If you want to read a book that is a fine example of Mystery, Historical Fiction and Magical Realism with questions about the darkness of the human nature, a book free from the awful stereotypes that are smothering the Literature of our times, then Unbury Carol is waiting. Definitely sounds like a book for me! Wonderfully written review, Amalia! Thank you so much, Marialyce! !